The EU Infopoint organised an Organic Agriculture and Biodiversity Panel Discussion at the EU Infopoint on June 29 from 17:00 – 19:00. 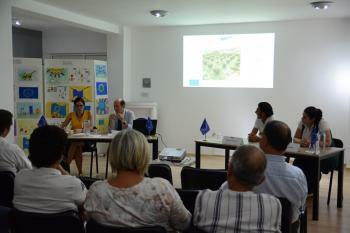 The panel brought together an EU expert, local experts, and practitioners to discuss organic agricultural practices in Cyprus and its effects on biodiversity; EU policies on agriculture and organic agriculture; and success stories from the EU. The EU Infopoint organised this panel to raise awareness on the effects of organic farming on biodiversity by involving relevant stakeholders such as farmers, practitioners, decision makers, CSOs and experts. The panel not only aimed to raise awareness but also showed practical information and applications for practitioners and farmers. The panel included a session for the participants to interact with the speakers and ask questions related to organic farming, biodiversity and agriculture in general. Luigi Guarrera, from the Italian Ministry of Agriculture and CIHEAM-IAMB Mediterranean Agronomic Institute, Nursel Ekici from Erson Hoca’s Organic Farm and two agricultural engineers Salahi Atalar and Samiye Kasap participated in the event as the speakers.